1. 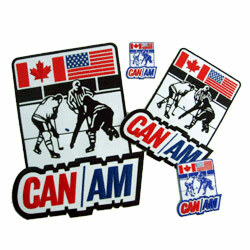 Ice hockey game embroidered patches, included one 3D-embroidery. 2. Used for ornaments, promotions, sportwears, hats, bags or souvenirs. 1. There is one special patch at right bottom of the image, its letters are with 3-D embroidered. 5. Sew-on or iron-on by plastic backing or heat-sealed backing, Velcro, and so on.